Installation of the plastic septic tank and pump well. If you live on a property that is not connected to the town sewer, you have an onsite wastewater management system. A properly designed, installed and maintained onsite wastewater management system allows you to treat wastewater (produced from all the water used in your home) and safely dispose of it onto your own land, without endangering the health of you and your neighbours, or harming animals or the environment. 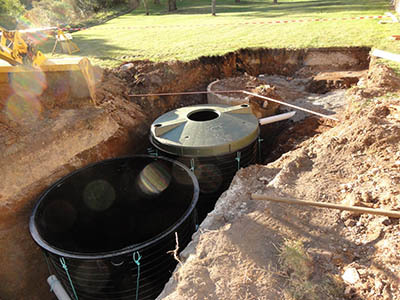 Septic tanks (with associated trenches) are still the most common type of treatment system, however they are increasingly being replaced by more advanced technologies including biological filter systems and aerated wastewater treatment systems. There are also several ways to apply the treated wastewater (effluent) to a dedicated area of land on your property, including soil and sand mounds, absorption trenches, and irrigation. There are over 20,000 onsite wastewater management systems in the Sydney drinking water catchment. Ensuring onsite wastewater management systems are well maintained helps protect the Sydney drinking water quality of approximately 5 million people in Sydney, the Blue Mountains, Illawarra, Southern Highlands, Shoalhaven and Goulburn. well maintained to ensure they continue to function properly without contaminating local waterways, spreading diseases or odours. Onsite wastewater management systems use a two-part process to treat wastewater (all the water used in your home) and then safely dispose of the effluent (treated wastewater) onto your property. Property owners in the Sydney drinking water catchment are responsible for the maintenance of their onsite wastewater management system to ensure it meets health and environmental performance standards. Councils are responsible for the regulation of wastewater management in their local government area. Local councils approve the installation and operation of onsite wastewater management systems, carry out inspections of existing systems, and work with property owners to repair faults. Identify what type of onsite wastewater management system you have, and understand its service and maintenance requirements. Learn the location of your wastewater treatment system and the layout of your effluent application system, so that you can avoid damaging it as well as monitor its performance and identify any leaks, overflows or other problems early. If you are installing a new system, get advice on the right type to meet your needs and get council approval to operate it.